I was reading Tony Karrer’s excellent blog, in particular a post on simulations, games, and social learning, and wanted to express my take on virtual worlds as a social learning tool. I have shifted from a purely “eLearning” use of virtual worlds to also developing environmental science activities aimed at Earth Science students (7th grade). I have been doing corporate eLearning for about 8 years and before that I was an Environmental Science professor at Miami Dade College for seven years and for three years prior to that, a private school science teacher. While I love doing eLearning development work in Flash (I even ran my own Flash forum for a few years), I truly love teaching and developing curricula. *barf* okay, i feel better now! virtual worlds are instant rendering 3D applications. try creating a room in Blender 3D, add physics to it (there is a Blender game engine), put a person in the scene (Make Human is an open source person creator for Blender – like Poser) and then create a walk cycle and render out a one second walk at 24 frames per second. just the rendering will take a few minutes (could be hours too – did you know that some individual frames of the movie Cars took up to eight hours to render?). now add to that the ability for the Blender person to chat, create prims, do scripting, and be able to view thousand’s of objects and hundred’s of textures and you would have, err, you’d have a virtual world like second life or opensim! currently, 3D LCD projectors are all the rage for K-12 but that means big expenses for schools to buy not only the projector, but also the 3D class materials. in the end, students are simply looking at 3D art. why not go a less expensive route with virtual field trips where you could even collaborate with other schools in other countries? Quite a stir in the twittersphere on yesterday’s news of Ener Hax’s account being disabled by Facebook. You may know that I am partial to Ener, after all, we are partners in virtual world endeavors. Ener became the the clear “spokesperson” of our inbound marketing efforts. I think of her as the Erin of Esurance (both have pink hair) or as Danica Patrick of GoDaddy.com (both go around in circles fast). When I first started setting up the social networking accounts two years ago, everything was being set up as iLIVEisl (I live in simulator lands). I simply followed the advice laid out by Maki of DoshDosh.com. Wonderful tips, links, and strategies to increase your web presence. From Cafepress and Busted Tees to Twitter and Facebook. It quickly became clear that Ener Hax had more traction than an abbreviated phrase. Plus, as a pink haired and winged avatar, Ener Hax is easier to form a connection with. A few years back, Ener was content with only existing in Second Life. But as the internet presence grew, she embraced that aspect and grew it exponentially. The “campaign” I was aiming for was to increase Second Life land sales of the iliveisl estate and promote the eLearning conferences I speak at. Using virtual worlds as an alternative to 3D animation applications (Blender 3, Maya, Studio 3D Max) is something I still practice and well received as a presentation. However, the shutting down of her Facebook account ignited an interesting discussion of what it means to be an avatar. Is Ener Hax, as a virtual identity, a real person? There are very real assets tied to the name. The 12 sims in Second Life are, as well as all of the objects being created for our Reaction Grid endeavor. There are real world items and business that belong to that virtual identity, to an avatar. Not only does Ener Hax make real money but the reputation associated with her is valuable. Ener Hax also does custom projects and deals 100% as an avatar in them. Is the line blurring with identity? Or is an avatar simply an alias like a “doing business as” identity? Facebook does allow avatars to have pages, but they have to be fan pages (which is what I wanted to initially set up – they do not have the 5,000 friend limit). 5,000 sounds like a lot, but over a six month period, Ener had 3,800 friends. 90% of which are avatars. Also, Linden Labs is looking to connect Facebook to Second Life. The decision to disable avatar accounts puts limits the value of integration. I build as Subquark Hax in-world, not as David Miller. Subquark has a certain credibility level in virtual worlds and not many know my real world name, nor does it matter. There is less room to bs about your skills in virtual worlds. Either you can build and script or you can’t. A simple right-click on an in-world object will reveal its creator. As my rockstar, Ener Hax has capitalized on this Facebook issue and turned it into positive press and deeper web reach (I am slightly biased, as you can tell). Her Twitter efforts were magnified in the past 24 hours and now she has a bonafide Facebook fan page. They would like to interview the once shy and quiet Ener Hax because of all of this. So unwittingly, Facebook seems to have done us a favour! I particularly loved your tweets to M Linden last week asking him to have the courtesy to address you. The mighty, and tiny, Ener Hax. It’s been a whirlwind during the last two months. I am sure the same is for you with the holidays and year end commitments at work and home. But we all made it and I wish everyone the very best of happiness and prosperity in the New Year. Almost made it anyway! Many of you are likely like me, a few projects that should have been completed but somehow still on our plates (I would have thought the holiday food would have knocked some things off of my plate). Luckily, I had this week off from work but still could not complete all my projects. A few websites to make/complete and the Reaction Grid presence for our new endeavors (“our” being Ener Hax of iliveisl and myself, plus two other wonderful people – Nickola and DreamWalker). I have been going on and on about how Reaction Grid is great and a suitable alternative for Second Life (plus a far better price point). The team at Reaction Grid are truly visionaries working hard on pushing the boundaries of virtual worlds. Two weeks back I had the privilege of trying out their new interface that allows you to log into Unity 3D via Facebook. I still have so much to learn and am not really certain how to explain Unity. But it allows you to venture into virtual worlds with your browser and a small plug-in. Similar to a Flash plug-in and you are actually in a virtual world via your web browser! That itself is huge news. No need to download a large client application or setup an account or worry about corporate firewalls. Kyle, from Reaction Grid, is also working on logging in via Twitter and LinkedIn. The ramifications are enormous of this move. He is also working on mobile device (phone) access. Over on the Second Life iliveisl estate, Ener has a dedicated sim tester who is an expert scripter and once a month does extensive testing of each of our sims. He has a standard script he runs to benchmark and compare our sims with grid wide performance. He came over to our grid that we have in Reaction Grid and his findings were impressive. Out of curiosity, I took my sim timing test scripts over to the Ener and subQuark Reaction Gridvenue which runs on OpenSim. I don’t know that I had any real expectations, but did I get a big surprise. They ran 30 times faster!!!! That is an outrageous difference! And one soon to grow larger as Chris from the Reaction Grid team implements a new build of OpenSim. Nice job Kyle! Well back to projects! Maybe I will get to mine this year (I always put mine last anyway and would have it no other way). Happy New Year and much happiness and prosperity! This is, of course, a wonderful article to read about a service we provide-thank you Sub! I must accredit the development of Opensim to http://opensimulator.org & the amazing work of the core developers large and small & to LL for developing the client that Opensim initially has targeted. While we have seen major improvements this past year we are still on “alpha” code which means more quirks happen when you begin to push the limits with many users & scripts. As always a virtual world consultant needs to weigh the pros and cons of each platform per the use case of the client. You know this yourself Sub being well invested in SL with sims & knowing not all users from there are ready for Opensim, yet. What you are helping to do is define the best use cases for Opensim versus other virtual world options. Your kind of testing will help avoid disappointment as users test the waters in Opensim because you are helping define an unknown quantity. Opensim improves each month but like any new software has weaker areas too. You are also seeing the benefits of our virtualization technology which shares hardware hosts but assures you of certain resources isolating you from most “‘neighbor” issues-see here http://www.microsoft.com/virtualization/en/us/case-study-detail.aspx?id=187 and allowing you access to the core guts of Opensim to hack up as needed . Opensim is a great alternative in many cases or at the least a great expansion move for Second Life users. It is not a replacement for the overall abilities or traffic of Second Life and will not be for 2010 and should even be thought of in those terms. It will continue to forge its own path despite being tied almost exclusively to the SL viewer to date. If I could have things my way Opensim and SL would seamlessly connect where appropriate which is what Infinity Linden is tirelessly working on http://twitter.com/infinitylinden (please join theTwitter list and voice your interest). New viewers from scratch are in production but will not mature to replace the SL client for general use in 2010 though will likely show they are ready to compete. I could easily be proven wrong here but we are talking about a very complicated viewer beyond even most video game clients. We do see these new clients as the best path forward for Opensim development and are watching them very close. It is much more about many smaller worlds or standalone sims interconnecting when you think of Opensim in today’s terms. It is the unwalled garden creatives hoped for. It is the flexible solution developers can hack up. It is something teachers who invest out of pocket can afford. It will one day become as viable as solution as SL but for now it remains for the patient, for the pioneers, for those without a massive budget to participate in virtual worlds. And for the record, that’s pretty darn special in itself. Thanks Sub our team is taking notes form your experiments & very much appreciate the help here. Nicely explained Kyle. With you as CEO of Reaction Grid, people will see it’s development continue in ways that Linden Labs can not follow. By that I mean that you are passionate about virtual worlds as a true tool for people and business. In my opinion, Mark Kingdon can not do the same. He is not from a background of virtual worlds nor seems passionate about them, at least not on the order of you or Philip Rosedale. While users like us (iliveisl who was identified as a high profile user – wow, my head will surely swell) may help point out desired things (like groups), a person like Kyle actually forges new and unseen directions. That is the biggest reason we are in Reaction Grid! The value of having someone so passionate (and Kyle is extremely passionate) coupled with a personality that will get things done makes a wonderful combination. While Kyle is the CEO, he is first and foremost an enthusiast. Frankly, it’s hard to understand why anyone would not want to come along for the ride! Never stop Kyle! You are creating such a useful tool and that is evident with your wins – both large and small. Inbound marketing? What does that have to do with eLearning? Almost anything you do can benefit from better recognition. It could be the soccer team you coach – create a team blog, put photos on Flickr, tweet and soon sponsors will be coming to you! For corporate eLearning departments, why not boost the reputation of your company with its customers by showing how you train your co-workers to serve those same customers better? You have a lot to share and it is becoming a standard thing to have a decent social face. People want to be able to participate in a conversation with you. The days of having a website and calling it good are past. Some work cultures are not there yet and I can empathize with you. I get my social networking practice with our (iliveisl) virtual world business. Now that is expanding to include our affiliation with Reaction Grid as a reseller. Fortunately, it is easy to slightly redirect the online spokesperson’s “branding” to include this latest venture in OpenSim-based worlds. When I started out making this online “brand”, I created accounts on everything I could think of – from CafePress to LinkedIn to Threadless Tees and even UrbanDictionary.com. A year or so later, it has simplified to mainly blogging, Twitter, Facebook, and Flickr. Our spokesperson Ener hax, enjoys great SEO in both Google and Yahoo. But these results are not from any secret. Starting with DoshDosh.com and experimenting, I found a combination that allows me to fan these flames with only 10 minutes per day. The biggest aspect of this is how Twitter can tie it all together. 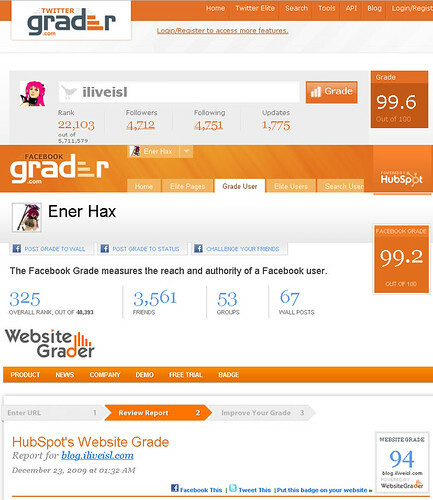 And to measure what works, I use Google analytics plus the free tools from HubSpot. Keeping an eye on your ranking helps hone your efforts and reduces the amount of time you spend while getting better results. It does take time but can also be rewarding and fun!